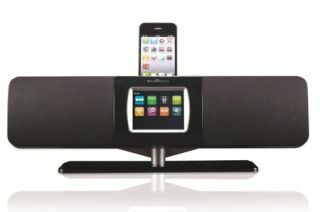 Magicbox Beam combines iPod docking, DAB and streaming | What Hi-Fi? Magicbox's new Beam aims to be a dock with a difference. Alongside its Apple iPod/iPhone docking, this new wi-fi capable speaker system offers DAB, FM and internet radio, and can stream from your PC. Like a similar - if dockless - device, the Pure Sensia, the Magicbox Beam is controlled via a 3.5in colour touchscreen on its front panel. There's also a remote control handset if you want to keep your distance. The system also offers a line input for other devices, a wall-mount bracket (the Beam's base comes off if you want it on the wall), and a set of clock and alarm functions - including your choice of source to wake up to. The Magicbox Beam will be available from 15th September, priced £180. We hope to review it shortly.